You need special software to deal with the Android-phone-to-Macintosh connection. That’s because the Mac doesn’t natively recognize Android phones. Weird, huh? It’s like Apple wants you to buy some other type of phone. 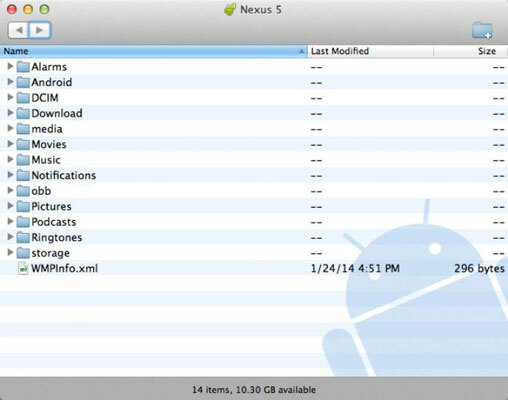 To deal with the Android-phone–USB connection on a Mac, you need to obtain special software, the Android File Transfer program. On your Mac, download that program from this website. Install the software. Run it. From that point on, when you connect your Android phone to the Macintosh, a special window appears, similar to what’s shown. It lists the phone’s folders and files. Use that window for file management. The Android File Transfer program. You can transfer files easily between your phone and a Macintosh (and a PC) also by using cloud services such as Google Drive and Dropbox.